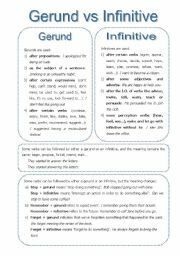 In the first page, you´ll find an explanation about the use of the Gerunds and the Infinitives. And in the following two pages, there are different types of activities. 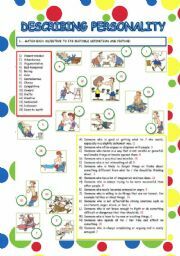 I hope you´ll find this worksheet useful! There are two activities related to the opposite adjectives: 1.- Students match the pairs of adjectives. 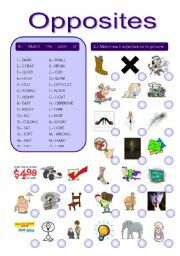 2.- Students match the adjectives to the pictures. I hope you will find it useful! 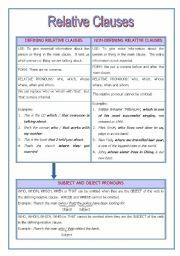 This worksheet is related to Defining and Non-defining Relative Clauses. First, you´ll find a clear explanation about the topic. Then, there are four activities where both types of relative clauses can be practised. Finally, the answer key is provided. 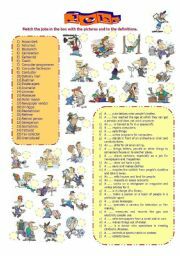 I hope you will find this worksheet useful! **I would like to say thanks to MPOTB because she allowed me to use the pictures in her worksheets. ** This worksheet is about jobs. Students match the jobs to their definitions and also to the pictures. If you want me to send you the answer key, just let me know: I can e-mail it to you. 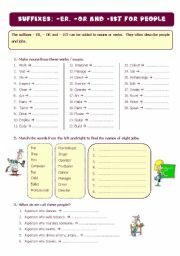 This is a worksheet related to jobs and to the suffixes -er, -or and -ist. There are three activities. In this worksheet, there is a simple and short explanation and there are four activities. I hope you will find it useful! This worksheet is about adjectives related to describing personality. Students match the jobs to their definitions and also to the pictures. Answer key is included: make sure you delete the answers before using it with your students. In the first two pages, you´ll find a useful summary of both Modals and Modal Perfects. 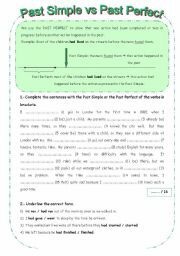 In the next pages, there are seven activites to practise this grammar point. The answer key is below each activity, so remember to delete it before using the worksheet with your students. This worksheet is related to the Future Continuous and the Future Perfect. There is a brief explanation and some activities. Learn the parts of the body with Shrek and Donkey. I created and used this powerpoint to explain the passive voice to my second bachillerato students. I think it helped them to understand it better. 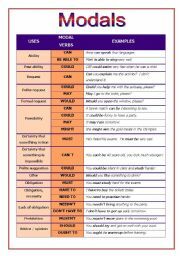 It´s divided into different parts: structure, use, by + agent, verbs with two objects and the passive with reporting verbs. I created and used this powerpoint to explain the linkers of contrast to my second bachillerato students. I think it helped them to understand it better. I created and used this powerpoint to explain the linkers of purpose and reason to my second bachillerato students. I think it helped them to understand it better. I created and used this powerpoint to explain the linkers of result to my second bachillerato students. I think it helped them to understand it better. This powerpoint is useful to explain the topic of countable and uncountable nouns. Students are given 20 seconds to memorize a picture. Then, they write what they have seen. I got this idea from a course taught by Visi Alaminos. Thanks Visi for the great ideas you taught us!!! Learn some verbs of movement related to the sports topic. This is a matching activity.